2016 Chronicles : Go Ahead Be Jealous! I am a strong advocate for professional jealousy. Contrary to popular opinion, I believe the green eyed monster is your friend [if harnessed properly]. It has served me well for years. I am not talking about hate or contempt. I am talking about an honest to god, “I wish I had that” feeling. Now jealousy must not lead you to automatic hate and contempt of the person/object of your jealousy, because that way you learn nothing from them. what did they do to get it [the thing i wanted]? how can I learn how to get it ? Does it align with my plans(because jealousy can derail you from your current plans too, by distracting you )? Then use the lessons to rockstar your way to the next level. Now go forth and allow your jealousy to make you better. 2.Now who lied to you that real women should not compete? Admittedly these memes are feel good [I also once believed this], but I now call bull on the notion. I can assure you all the women in the picture below are all fierce competitors! 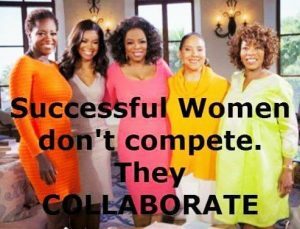 Now slowly say to yourself “Real Men don’t compete, they collaborate”. Does it sound right to you! 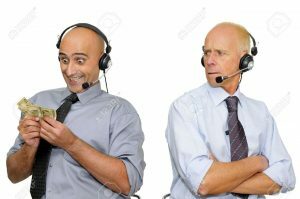 Exactly: If you are women or man and you are in the same space as my organization EDEL and targeting the same set of customers. Yes Girl I am here to compete and I will be competing hard! When it increases market share for all parties e.g. if you are in the ecommerce space [only 5% of the population use ecommerce] and you work together to increase market size to 15% of the population so u can both make more money. 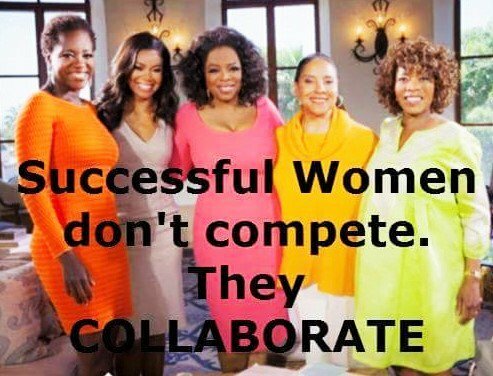 When Collaboration provides more opportunities for other women. Otherwise go forth and compete like hell!